Three police officers were shot in a confrontation in Kansas City on Sunday. A man wanted for questioning in the murder of a college student shot three police officers in Kansas City, Missouri, on Sunday during a series of firefights that began at a motel and ended with his death when he bolted from a house with his rifle blazing, authorities said. The shooting erupted just after noon at a motel in the city where undercover and tactical officers were conducting an investigation into the robbery and killing at a restaurant last week of a 25-year-old University of Missouri-Kansas City student, police said. 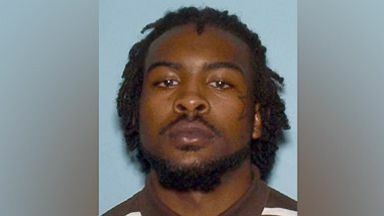 The suspect who was shot and killed by police was identified Monday by authorities as Marlin Mack, 25. (Kansas City Police Department) Marlin Mack, 25, was identified as the suspect who was shot and killed by police Sunday during a series of firefights in which three police officers were wounded. Kansas City Police Chief Rick Smith said detectives had been conducting surveillance on Mack as a person of interest in the July 6 murder and had followed him to the Sky-Vue Motel on Highway 40 on the east side of the city. "Our officers then engaged with the person that they were trying to surveil and there was gunfire," Smith told reporters. "At that point two of our officers were shot." The suspected gunman, armed with a high-powered semiautomatic rifle, fled the scene in a vehicle with a second individual, police said. Officers chased the vehicle to a residential neighborhood near the intersection of 30th Street and Topping Avenue and arrested one of the men who had sped from the motel, police said. Mack allegedly ran from the vehicle, barricaded himself in a home in the area and fired on officers as they approached the residence, Smith said. A third detective was wounded in the firefight, hit in the forearm by a bullet, Smith said. 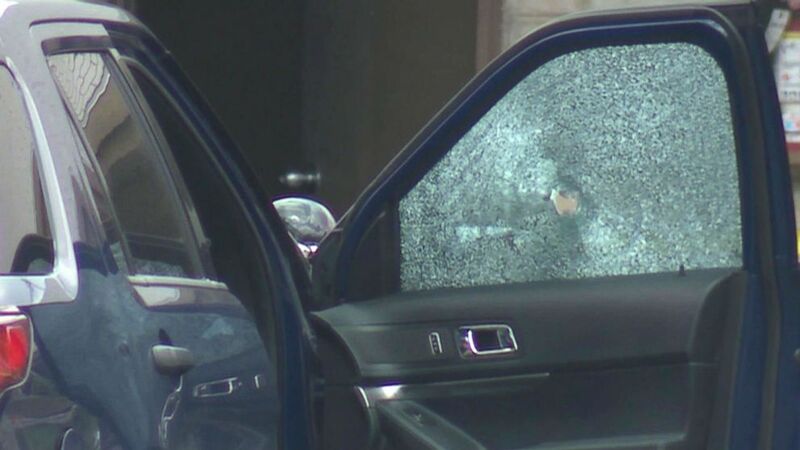 (KMBC) A bullet hole in a car window at the scene in Kansas City, Mo., July 15, 2018, after several police officers were involved in a shoot-out with a suspect and three officers suffered gun-shot wounds. He said all three wounded officers were in stable condition on Monday and treated in a hospital for "non-life-threatening injuries, thank God." One of the officers was expected to be released from the hospital Monday afternoon, Smith said. "We then engaged with the suspect several times," Smith said. "There was a firefight." He said the suspect came charging out of the house allegedly firing his rifle at officers who returned fire, shooting the gunman. He said multiple shots were fired in at least four different gunfights with the suspect. Mack was declared dead at the scene by the Kansas City Fire Department. The shooting unfolded after police followed the suspect to the Sky-Vu Motel as part of their investigation of the July 6 robbery and slaying of Sharath Kopuu, a student at UMKC who is from India, police said. Kopuu was fatally shot in the back by a robber at the J’s Fish and Chicken Market in Kansas City, where he worked, police said. 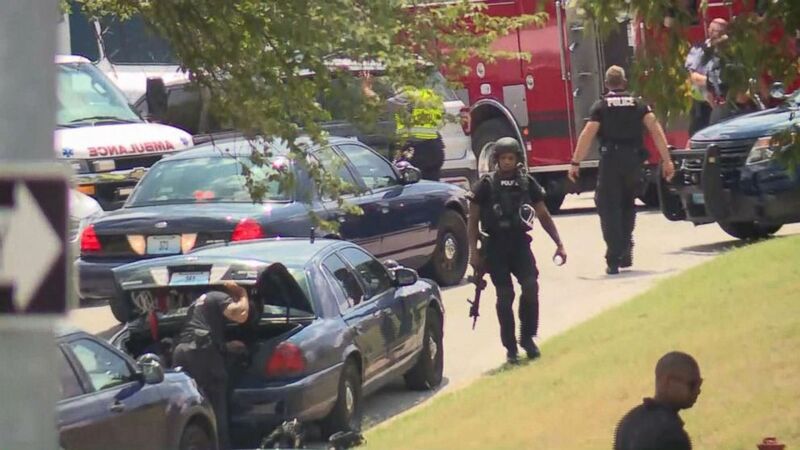 (KMBC) Police on the scene in Kansas City, Mo., July 15, 2018, after several police officers were involved in a shoot-out with a suspect and three officers suffered gun-shot wounds. A security video at the restaurant captured an image of Mack and police said they received numerous tips identifying him and leading officers to his location. I wish to share my deepest sympathy and condolences with the family and friends of Sharath Koppu, a UMKC student who fell victim to senseless violence. Sharath and I share an Indian heritage, but all of us at UMKC share in the grief such tragedies bring. "We've been looking for him all week," Chief Smith said of the person of interest in Kopuu's killing. "This was the first time we laid eyes on him." 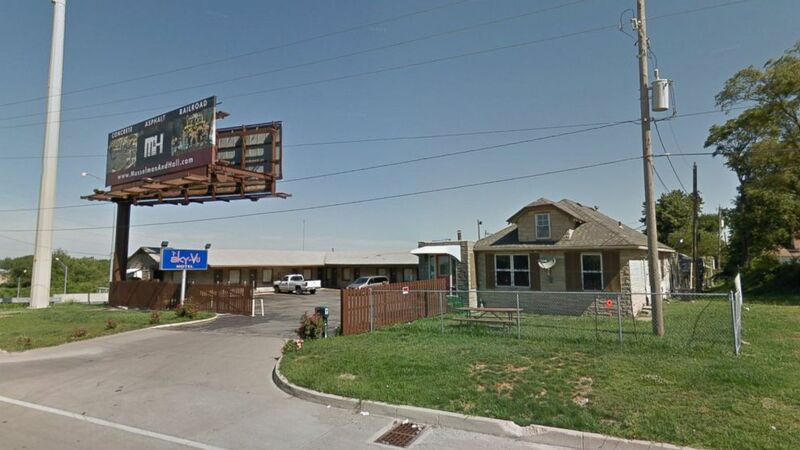 (Google Maps) Sky-Vu Motel at 8300 E. Highway 40 in Kansas City, Missouri. In a Twitter post on the violent encounter, Missouri Gov. Mike Parsons said, "Our law enforcement officers face dangers every single day. We are grateful for the risks they face to keep us all safe. Our thoughts and prayers are with the members of the @kcpolice department and their families." In a GoFundMe page for Kopuu, his cousin, Raghu Chowdavaram, wrote that Kopuu was a computer engineer in India who came to the United States in January to pursue a master's degree. "Sharath is known to his family and friends as full of dreams, cheerful, energetic and athletic," Chowdavaram wrote. "He had the same dreams like everyone else to make it BIG in the land of opportunity. He had a great sense of humor, and always made people laugh and was always eager to lend a helping hand."